Compiled from the ABC TV Series Pilot Guides, comes an interesting documentary about some of the world's greatest festivals from this little blue planet. Best of all, this collection is a holistic experience from ancient festivals that date back hundreds of years to more modern journeys such as the Notting Hill Carnival. From food to spirits and everything in between, this is definitely a culture shock... in a good way. Running at just over 150 minutes, Great Festivals is quite a laid back documentary series that is a mirrors the excellent Lonely Planet series from its visual cues to the excellent presenters. 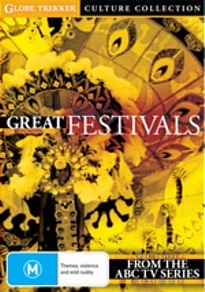 The episodes are uniquely labelled "Great Festivals 1, 2 & 3" and traverses the globe without any thought. This is not a bad thing as it keeps the episodes quite fresh and interesting as it highlights a variety of countries, races and cultures. As you can see, the festivals highlighted in this collection are extremely diverse and include all facets of information from food to religion to just good old fashioned enjoyment. Although I'm not sure where the Oiled Wrestling Festival from Turkey fits into the mix with all those oiled men. Disturbing but deliciously entertaining! Nonetheless, the series is quite informative and really showcases the amazing festivals from around the world and all those involved really get into them. Amusing is another world that describes this documentary series well because seeing the Finnish carry their women in a race must be seen to be believed and strangely enough, they are quite competitive. What I would have liked to have seen more in this DVD is some more historical information because at best, it's quite limited. That is probably the only downfall but given that there was only 155 minutes to play it, I can almost forgive the producers for this small neglect. Presented in 16:9 widescreen, the video quality is quite good for a documentary of this calibre with sharp images, minimal artifacting and a good colour palette. The audio is only Dolby Digital 2.0 and when the drums of Trinidad start pounding or you hear the cheering of the crowd from Rio de Janeiro, your speakers do get a workout. Unfortunately there are no special features included on this DVD. In conclusion, Great Festivals is a good DVD from start to finish that highlights the wondrous world we live in. Each festival is quite short and before you know it, you'll have travelled around the world and will have enough information to be an entertaining hit at your next dinner party. Check it out!